Breaking from post position two in a field of eight older fillies and mares, Enola Gray sat just outside of eventual third place finisher Desert Steel down the hill through splits of 21.55, 43.04 and 1:05.86. Head and head at the dirt crossing three sixteenths of a mile from home, Enola Gray asserted her superiority leaving the sixteenth pole and won in-hand. Off at 3-5, Enola Gray paid $3.20, $2.40 and $2.10. A winner of the California Distaff Handicap down the hill three starts back, she is now unbeaten in two starts over the unique hillside layout. 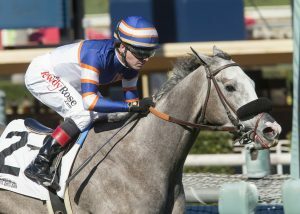 Enola Gray, who was most recently third in the Grade I, seven furlong La Brea Stakes on Dec. 26, now has five wins (four of them stakes) from eight starts. With the winner’s share of $90,000, she now has earnings of $449,100. Alexander, a longtime owner/breeder in California who is well known to millions of Southlanders through his Nick Alexander Imports radio commercials (“Nick Can’t Say No”) is now chairman of the Thoroughbred Owners of California (TOC) as well. Grazen and Alexander made it back to back wins when the three-year-old homebred All of a Sudden made her second start, in the third race on the card, a winning one in taking the Cal-bred maiden special by a head.